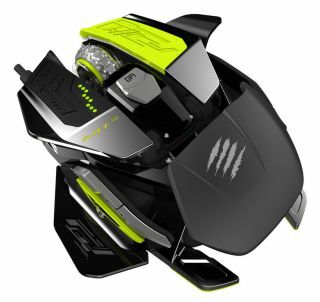 Mad Catz has announced that it is now shipping the Rat Pro X, and it has also announced the Rat Pro S, both of which are adjustable gaming mice that look as close to Michael Bay Transformers as gaming accessories are likely to get. The Pro X is even more customizable than Mad Catz's previous mice, so let's go down the list. The Pro X has a range of modular parts, offering a choice between optical and laser sensors, each with built-in memory for up to nine profiles. You also have the ability to adjust the click force of the scroll wheel, or even swap out the wheel itself. The mouse ships with three to choose from. There’s also an analogue strafe feature, giving you control over the horizontal movement of the scroll wheel. The Pro X also comes with a number of swappable thumb and pinkie rest designs. The pivoting palm rest can be adjusted, and you have a choice of textures and materials for the feet. Your sensor options are a Phillips Laser at 8,200 DPI, an Avago Laser at 8,200 DPI, and a PixArt Optical at 5,000 DPI, though it's important to note that the mouse only comes with one of these sensors—you have to pick which to buy. The Pro X has 10 programmable buttons. Mad Catz says the mouse is future proof, since when a new sensor comes along, you’ll be able to simply swap it in—assuming the mouse is successful enough for Mad Catz to continue supporting it with new sensors, of course. It’s made out of a magnesium alloy chassis, which Mad Catz says is 50 percent lighter in volume than titanium and 30 percent lighter than aluminium. The palm rest and buttons are also coated in a material that is supposedly resistant to moisture. All that luxurious customization comes at a cost of $200. As for the Pro S, you’ll be getting a cheaper mouse which doesn’t have the modular parts, but retains some of the important features from the Pro X. You’ll be stuck with the 5,000 DPI optical sensor, and you’ll only get three custom profiles. It has eight programmable buttons compared to the Pro X’s ten. It's a little lighter, at 77g compared to the Pro X's 105g. Both are now available for pre-order from the Mad Catz store. The Rat Pro X costs $200, and the Rat Pro S costs $70, though they're currently showing as out of stock for us.